Leave all your price calculation worries to us. With our extensive range of price computing scales, you can make your customer dealing simple and quick. 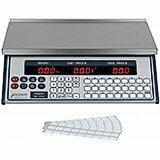 These price computing scales are user-friendly and provide accurate weighing results. They are ideal for use in cafeterias, bakery shops, bar counters, produce markets, delis, supermarkets, and a lot of other food serving establishments that regularly experience heavy traffic. These price computing scales come equipped with clearly readable LCD displays that provide information such as weight, unit price, and total price. Select models also let you print sales labels with the price and weight of the product along with the store name, and a bar code. Stored data facilitates quick checking in case of any discrepancies in the accounts. Price Computing Food Scale, Digital, 15 Lb. Price Computing Food Scale, Digital, 30 Lb. 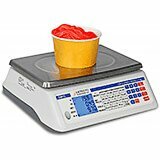 Price Computing Food Scale, Digital, 60 Lb. Stainless Steel, Price Computing Food Scale, Digital, 15 Lb. Stainless Steel, Price Computing Food Scale, Digital, 30 Lb. 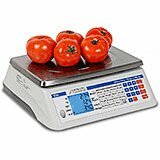 Stainless Steel, Price Computing Food Scale, Digital, 6 Lb.